Late last year, a sleek monument was quietly added to the Semper Fidelis Memorial Park outside the National Museum of the Marine Corps. 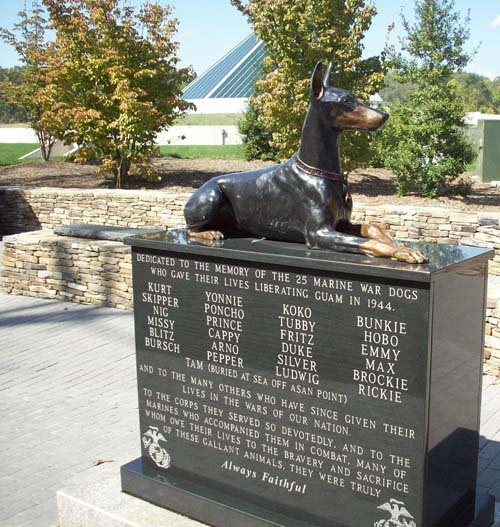 Called “Always Faithful,” it’s a memorial to Marine Corps military working dogs, inscribed with the names of each of the 25 Marine “War Dogs” killed during the 1944 liberation of Guam: Skipper. Tubby. Max. “To the Corps they served so devotedly, and to the Marines who accompanied them in combat, many of whom owe their lives to the bravery and sacrifice of these gallant animals, they were truly always faithful,” it reads. The statue is the bronze original casting of a granite memorial installed at Naval Base Guam in 1994, the 50th anniversary of the battle for liberation. And it was donated to the Marine Corps Heritage foundation by retired Gen. Carl Mundy Jr., 30th Commandant of the Marine Corps. “I’m an animal lover, so it’s not hard for me to have some affection,” Mundy said. I reached him by phone from the Dolphin Research Center in Marathon, Fla., where he sponsors a dolphin called Jack. Animal lover is right. Mundy, then commandant, was in Guam for the dedication of the first statue during commemoration of the battle’s 50th anniversary. He would come to know the monument’s sculptor, Susan Bahary, as a friend. When he learned recently that only Bahary’s artist’s proof of the statue remained and saw new monuments being added to Semper Fidelis Park, he knew what he wanted to do. “We need to remember the dogs as well,” he said. Though the combat-trained canines are referred to as military working dogs today, Mundy said he still prefers original term “war dogs” as more descriptive and accurate. Since 1944, dogs have become some of the most specialized warriors in the U.S. armed forces: 4,000 were used in various capacities in Vietnam; 281 never made it home. Today, war dogs typically work as skilled bomb and explosives detectors or aggressive guards and attackers. A Belgian Malinois named Cairo was with the SEAL Team Six operators on the Osama bin Laden assassination mission. Another Malinois named Bart was with the SEALs who perished in the tragic Chinook crash that killed 30 in Afghanistan in August 2011. According to JBMF.us, at least 20 dog handlers and eight war dogs have been killed in action in Iraq and Afghanistan, and that number may not count the most recent casualties, such as MWD Bak, an Army dog reportedly killed March 11, 2013.